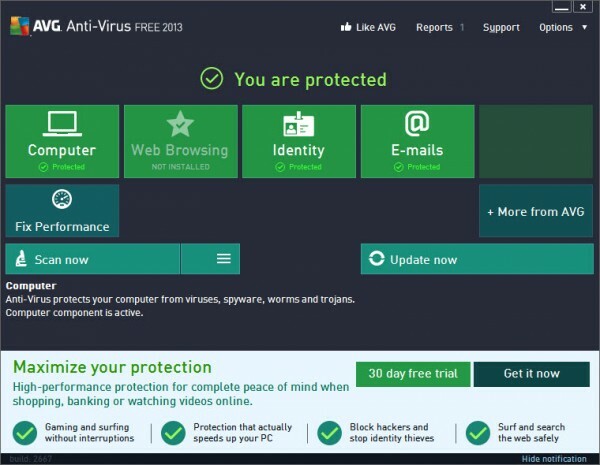 AVG has come up with its 2013 version of security products which include a free edition, antivirus and internet security softwares. 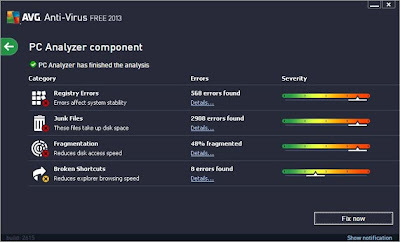 We’ll discuss about the AVG Antivirus Free Edition 2013. 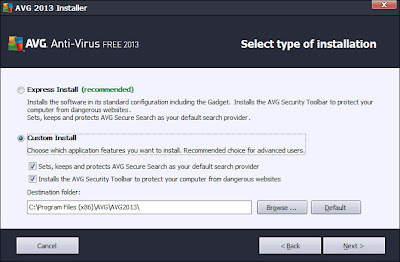 AVG Antivirus 2013 Free Edition has all the necessary security features for detecting viruses, spyware, malware and stopping them entering your PC. AVG’s free edition gives you perfect blend of strong detection and smart performance which can be seen usually in upgraded or advanced security products. The significant improvisation in this latest version is Windows 8 and the appearance would be the compatible with Windows 8. It takes about 5 minutes to complete three stages – Download, Installation and Product Usage. The setup file is reduced to 33MB and more importantly it doesn’t require a re-boot to complete the whole process. You will be prompted to install AVG toolbar and SafeSearch which are considered to be the basic needs for your internet browsing. While you can opt out of this, but AVG recommends you to have unless you don’t have any other security add-ons or extensions which are better than these two essential protection features for online activity. 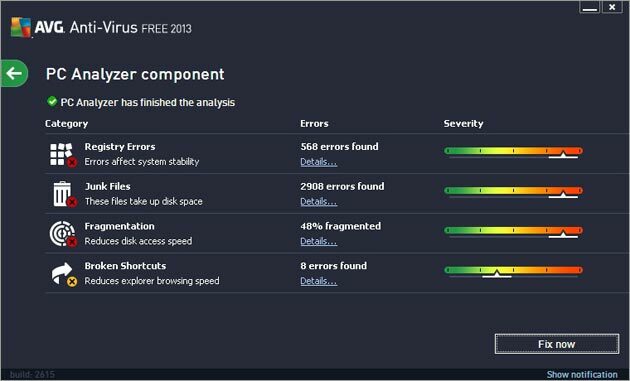 As said earlier, the most important aspect of AVG Antivirus Free 2013 would be the improved interface which now works with Windows 8 and looks similar to Metro-style, as all security vendors have changed their appearance compatible with Windows 8. AVG Antivirus Free 2013 looks like more clutter-free and pleasant as the new interface has large tile-like buttons similar to Windows 8 and regular links on the upper-side such as Reports, Support and Options. Apart from its interface tweaks and improvisation, AVG Antivirus Free 2013 had managed to get little better in decreasing the impact on boot and shutdown times as well as scanning times. As AVG Antivirus Free 2013 is only for non-commercial and single users, we cannot expect advanced features compared to its upgraded versions. Let’s look at those basic and important features which work well for all Windows operating systems. Smart Performance technology that lessen annoying system freezes and scanning times. Detects and blocks PC viruses and basic internet-related threats like spyware, malware, adware, etc. AVG Do Not Track – is a special feature which blocks internet spyware and Wi-Fi hackers saving your personal PC data. AVG On-Demand Scanner – performs scheduled and manual tasks. PC Analyzer – Removes junk files, registry errors, broken shortcuts and does disk fragmentation. A 24x7 telephonic and online support. Detects and removes rootkits, suspicious or fake antivirus, and provides primary email and privacy protection. Fixed issues related to E-mail Scanner, AvgSys, Core, SafeSearch, update and setup processes. The new Metro-interface welcomes with tile-buttons and hassle-free navigation. Automatically updates the latest virus-definitions and functionality. Finally, AVG Antivirus Free 2013 is not that kind of antivirus software which offers comprehensive PC protection, but as far as the basic level of security is concerned, it gives you greater deal of satisfaction related to system performance. The paid versions like AVG Antivirus and Internet Security will have extra benefits like strong firewall protection, if you are working on Windows XP or Vista OS.